I wanted to offer a bit of unique product that would motivate people to pull the trigger on getting their pictures taken. All too often it's easy to forget to schedule your yearly Christmas card photo, or even get pictures of your kids at an age when they seem to grow all too fast. 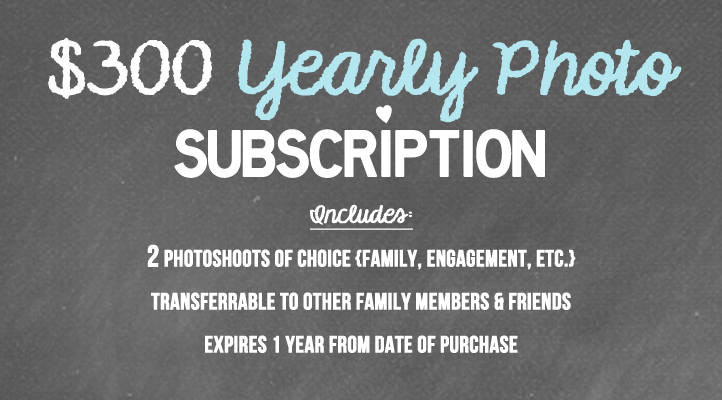 The subscription product encourages you to schedule two shoots per year, basically for the price of one. It is also transferrable to your family and friends, so if you don't get around to using it you can gift it to someone else who would really appreciate its value. Another benefit, I get to see you twice a year :). Starting a Business..1st Official Post!